According to statistics, more than 14 million people in North America embarked on cruise ship vacations in 2018. Another 11 million from various world countries also enjoyed cruises. Numerous cruise lines take passengers to Alaska, Asia, Australia, the Caribbean, Europe, South America, and many other world destinations. 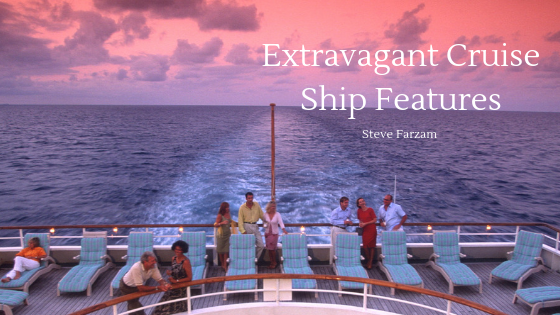 However, few realize the extravagant features available to passengers on cruise ships. A typical passenger’s cabin aboard a cruise ship encompasses up to 200 square feet. However, the wealthy who desire to cruise with their entire family might opt for the Garden Villa suites, which are available on Norwegian Cruise Lines. The suites encompass 5,570 square feet. The spacious lodging features three bedrooms and four bathrooms along with a private dining room and table that accommodates eight people. Additionally, guests have access to a garden terrace, a hot tub, and a personal servant. The ultimate in bedroom suites is available on the Regent Seven Seas cruise line. The Savoir bed features a mattress filled exclusively with horsehair. The linen on the bed is estimated at being worth more than $51,000. The bed also provides a spectacular view as it faces the windows overlooking the sea. The suite also comes with a Steinway piano. Back in the day, cruise ships featured an outdoor swimming pool and deck furniture. Today, cruise lines have water parks and other features. The Preziosa cruise ship boasts having the longest water slide. The incredible purple tube spans 394 feet in length. Part of the slide ventures out over the sea where a transparent section enables a surreal view of the water below. The prize for the tallest water slide goes to the Ultimate Abyss cruise ship with a structure than rises ten stories high. The Mein Schiff 4 cruise ship has the largest swimming pool, which measures approximately 75 feet in length. Centuries ago, punishment at sea might include walking the plank and falling into the shark-infested waters below. Passengers have the chance to experience the same dramatic stroll on the Norwegian Getaway. The ship has a narrow plank that spans eight feet beyond the safety of the deck. The walkway is also 160 feet above the ocean. Although sounding treacherous, passengers must don safety harnesses to prevent accidentally falling into Davy Jones’ locker.